The world's first vaccine against malaria will be introduced in three countries - Ghana, Kenya and Malawi - starting in 2018. The World Health Organization (WHO) said the jab had the potential to save tens of thousands of lives. But it is not yet clear if it will be feasible to use in the poorest parts of the world. The vaccine needs to be given four times - once a month for three months and then a fourth dose 18 months later. This has been achieved in tightly controlled and well-funded clinical trials, but it is not yet clear if it can be done in the "real-world" where access to health care is limited. It is why the WHO is running pilots in three countries to see if a full malaria vaccine programme could be started. It will also continue to assess the safety and effectiveness of the vaccination. 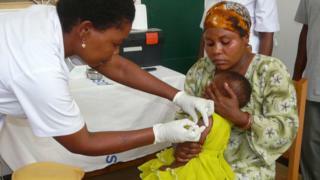 Dr Matshidiso Moeti, the WHO regional director for Africa, said: "The prospect of a malaria vaccine is great news. "Information gathered in the pilot programme will help us make decisions on the wider use of this vaccine. "Combined with existing malaria interventions, such a vaccine would have the potential to save tens of thousands of lives in Africa." The pilot will involve more than 750,000 children aged between five and 17 months. Around half will get the vaccine in order to compare the jab's real-world effectiveness. In this age group, the four doses have been shown to prevent nearly four in ten cases of malaria. This is much lower than approved vaccines for other conditions. It also cuts the most severe cases by a third and reduces the number of children needing hospital treatment or blood transfusions. But the benefits fall off significantly without the crucial fourth dose. Ghana, Kenya and Malawi were chosen because they already run large programmes to tackle malaria, including the use of bed nets, yet still have high numbers of cases. Each country will decide how to run the vaccination pilots, but high-risk areas are likely to be prioritised. Despite huge progress, there are still 212 million new cases of malaria each year and 429,000 deaths. Africa is the hardest hit and most of the deaths are in children. The pilots are being funded by: Gavi, the Vaccine Alliance, the Global Fund to Fight Aids, Tuberculosis and Malaria, Unitaid, the WHO and GSK. Dr Seth Berkley, the chief executive of Gavi, said: "The world's first malaria vaccine is a real achievement that has been 30 years in the making. "Today's announcement marks an important step towards potentially making it available on a global scale. "Malaria places a terrible burden on many of the world's poorest countries, claiming thousands of lives and holding back economies. "These pilots are crucial to determining the impact this vaccine could have on reducing this toll."